Throughout years of uprising and Israeli military actions, siege of West Bank cities and President Arafat's de facto house arrest, it was hard to imagine the situation getting worse for Palestinians. It has. 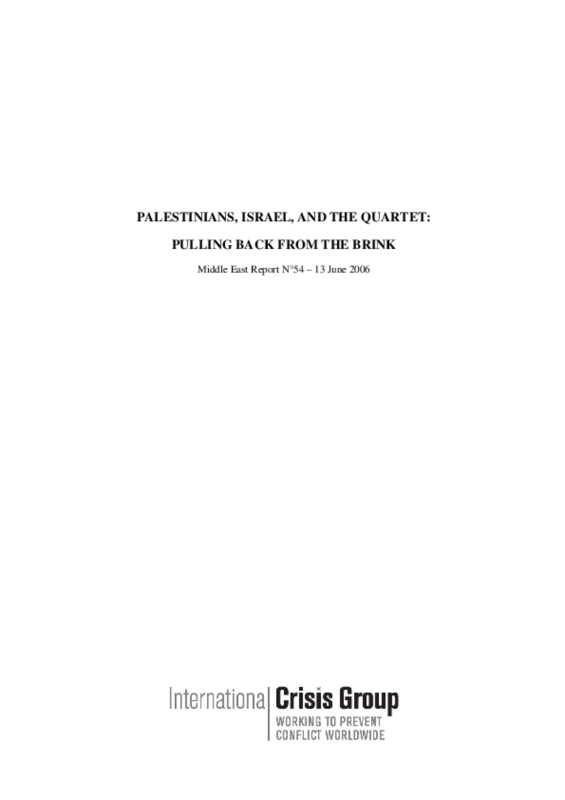 On all fronts -- Palestinian/Palestinian, Palestinian/Israeli and Palestinian/ international -- prevailing dynamics are leading to a dangerous breakdown. Subjected to the cumulative effects of a military occupation in its 40th year and now what is effectively an international sanctions regime, the Hamas-led Palestinian Authority (PA) government cannot pay salaries or deliver basic services. Diplomacy is frozen, with scant prospect of thaw -- and none at all of breakthrough. And Hamas's electoral victory and the reactions it provoked among Fatah loyalists have intensified chaos and brought the nation near civil war. There is an urgent need for all relevant players to pragmatically reassess their positions. This report is also available in Arabic at http://www.crisisgroup.org/home/index.cfm?id=4171&l=6.